What a year 2018 was. The world faced major challenges from political and economic uncertainty, and the concerning shift towards anti-globalisation continued. Also very troubling were the natural catastrophes that struck in all parts of the world, causing widespread destruction and claiming thousands of lives – it was the fourth costliest year in history in terms of global catastrophe losses for the insurance industry. With climate change very likely linked to rising sea levels and increased rainfall, the impact from flooding associated with tropical cyclones and other extreme weather events could be even more severe in the future. In 2018, the western Pacific typhoon season produced 29 named storms, higher than the average of 26.6, prompting floods and leaving thousands of people stranded. The possibility of even more, or worse, storms in the future is frightening. Other changes to our climate, including warmer temperatures and prolonged heatwaves, will likely also continue to increase the frequency and severity of large wildfires and droughts. It was devastating to see footage of the damage caused by the Californian wildfires late last year. Due to very dry weather conditions, the fires spread quickly and raged for over a week – in their paths, they sadly claimed lives and destroyed homes, even whole communities. What we’ve experienced over the past year must serve as a wake-up call to stand together in unity and step up our efforts against climate change. What’s at stake is not only visible in the footage, but also in the figures: the Swiss Re Institute estimates that total economic losses from natural and man-made disasters in 2018 amounted to a shocking USD 155 billion. Unfortunately, only USD 81 billion of this economic loss is insured, even though the majority of these losses occurred in developed countries. All in all, I feel that the re/insurance industry has done a good job over the last two years of paying claims promptly, allowing people to recover and rebuild following these events. We also supported people and businesses following devastating man-made disasters in 2018, like the collapse of the Ituango dam in Colombia. Swiss Re’s extraordinary financial strength enables us to support our clients in these tough times, and in 2018 we absorbed USD 3.0 billion of large claims to lessen the hardship for those affected by the disasters. We are proud of that, as this is the purpose of our business. Following these claims, we reported a Group net income of USD 421 million for 2018. Due to a US GAAP accounting change which took effect on 1 January 2018, our result also contains a negative pre-tax impact of USD 599 million because of challenging equity markets. On a like-for-like basis with the year before, our net income would have been USD 894 million for 2018. Our net income in our Property & Casualty Reinsurance segment was USD 370 million, mostly impacted by the natural catastrophes and the US GAAP accounting change. Amid the still challenging market, it was crucial that we maintained our disciplined underwriting approach, ensuring adequate prices for the protection we provide. In our Life & Health Reinsurance segment, I’m pleased that we were able to deliver strong growth driven especially by large transactions. 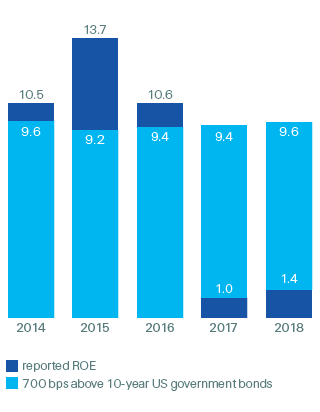 In this segment, we reported net income of USD 761 million in 2018 – evidence of the value of diversification in our business – and we continue to meet our return on equity (ROE) target range. The 2018 result for our Corporate Solutions Business Unit was, however, disappointing: we reported a net loss of USD 405 million. This result was impacted by low rates from previous years and also significantly affected by the man-made and natural catastrophe losses I mentioned earlier – an issue which the whole commercial insurance industry experienced. We took some tough underwriting actions last year and at the same time saw an upwards movement in rates throughout 2018, but more must and will be done this year. 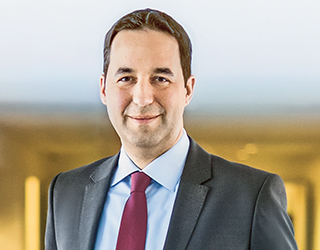 We also look forward to Andreas Berger joining us as our new CEO Corporate Solutions on 1 March 2019. Andreas brings more than 20 years of experience in the insurance industry, and his first priority will be developing actions to improve Corporate Solutions’ performance – we will share more on those actions along with our half-year 2019 results. In our third Business Unit, Life Capital, we once again delivered exceptional gross cash generation of USD 818 million in 2018 and exceeded our target range. Our preparations for a potential IPO of ReAssure continue. And we agreed with MS&AD on a further investment of GBP 315 million in ReAssure, resulting in a total shareholding by MS&AD in ReAssure of 25%. Meanwhile, our open book businesses in Life Capital continued to grow. I’m personally very optimistic about this segment of the Business Unit. This year may mark a turning point for Life Capital, which will look quite different if market conditions allow us to do a successful ReAssure IPO. The shift from being primarily a closed book business to a dynamic primary B2B2C business will be both demanding and exciting. By utilising technology and working with partners, we can help make insurance simpler and more accessible than ever. Speaking of technology, in my shareholder letter last year I wrote about how important it is for our business, so let me give you an update on that – and share one point of contention. While I personally continue to be very excited about what we can achieve with technology, I think the topic of artificial intelligence (AI) is overhyped. It’s often weakly defined – anything that is digital is put into the “AI box” – and there’s a particularly concerning narrative going around, which is that AI will cause many of today’s jobs to disappear in the near future. When talking to business partners, the consensus view is quite different and significantly less alarming: yes, jobs will change as they have always done, but the pace will be slower than some people seem to anticipate, and new jobs will emerge around these new technologies. We’ve invested significantly in technology at Swiss Re over the past years and I believe it will have a very positive impact on our business in the future. It will allow us to deliver better products to clients and help us build greater societal and financial resilience around the world. As I mentioned last year, it’s my priority to strongly position Swiss Re as a risk knowledge company, applying our immense knowledge and partnering with clients to protect more people – technology is our enabler and diversifier in these transformative times. For example, we’re rapidly growing iptiQ, our customisable B2B2C digital insurance solution. iptiQ brings together Swiss Re, primary insurers and other partners to sell life, health and property and casualty insurance. It has almost doubled its average weekly policy sale count over the past year and established itself as a leading platform in the digital insurance space. In this business, we have also developed an online virtual assistant called Eva, which will become the digital face of our partners’ brands. I’m really excited about this business and I believe that this partnership model could become a big part of who we are at Swiss Re. As many households still lack insurance cover in many areas, I see significant growth potential. We’ve also invested in building technology-driven solutions for our reinsurance clients. One example is our flood risk model, which we rolled out in the US last year as part of our efforts to manage uncovered risks caused by climate change and natural disasters. Only one in six homes in the US has flood insurance, even though the personal and economic cost of flooding is increasing every year. Flood insurance policies based on our model are priced according to the individual risk exposure, which is made up of thousands of data points, such as the location of a building, type of construction and insured value. Providing accurate pricing enables our clients – insurers in the US – to provide a more affordable product to homeowners and can potentially help make a significant difference in the coverage of this risk. 1 The 10% ENW per share growth target is calculated as follows: (current-year closing ENW per share + current-year dividends per share) / (prior-year closing ENW per share + current-year opening balance sheet adjustments per share). This target applies since 1 January 2016. The reported figures for 2014 and 2015 have been adjusted for consistency with the target definition and are provided for reference purposes only. The prospect of what we can achieve with technology is not the only reason I’m optimistic about Swiss Re’s future. In the January 2019 renewals of our Property & Casualty Reinsurance business, we were able to grow while keeping our running costs flat – in our industry, size and diversification matter. 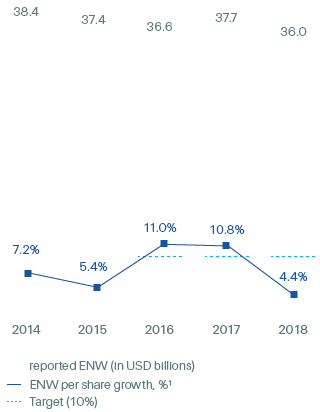 We renewed USD 10 billion in premium volume, an increase of 19% compared to the year before. Price quality increased by 1% and we expect further price improvements in the renewals later this year as a result of the 2018 natural catastrophes. In the commercial insurance space, prices also increased by 3% and positive momentum continues. Furthermore, our Life & Health Reinsurance franchise continues to grow, with new business profits contributing to our capital generation. And we expect emerging markets, including China, to contribute to stronger growth for insurance markets in the long term. I’m confident in Swiss Re’s future sustainable economic earnings, which are the basis of the attractive capital management actions the Board will recommend at our upcoming Annual General Meeting. For Swiss Re, risk pools represent the landscape of insurable risks worldwide. They evolve constantly, requiring close monitoring of their scope, frequency and magnitude. The cyclicality of natural catastrophes, new and emerging risks, such as cybersecurity, changes in the regulatory environment and insurance buying behaviour are all factors that affect the size and nature of risk pools worldwide. As a risk knowledge company, we actively seek access to those risk pools, directly or through our clients, to further diversify our risk portfolio. Coming back to my concern on climate change, though. I do feel that there is more momentum globally about this issue at the moment – but that’s not enough. At the current rate of action, climate change will likely lead to more natural disasters, with implications for every aspect of society and everyone – not to mention the consequences that could spill over to future generations. It will take a “whole of society” approach to limit global warming before time runs out. I’m optimistic that we can build on the current momentum and do that. At Swiss Re, it’s our priority to continue leading action on climate change and sustainability efforts, both on the asset and liability side of our business, and within and beyond our industry. All of our employees are behind that – for that, and for their commitment every day, I would like to thank them. I’d also like to thank you, our shareholders, for continuing to place your confidence in us.